About SBI! or Solo Build It! At least we think so... What's so special about SBI anyway? Same Ol' Thing or Best Choice? What About SBI? There are many ways out there to build a website, but we think the best way to build a life-changing business is with Solo Build It!. How do we know? Because we're doing it now. And so are many others. 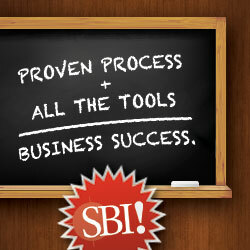 If you want to read the story of why we eventually chose SBI!, click here. You can also read about how Solo Build It! is changing the lives of others too. Have you been looking for a business that you can build and grow from home (or anywhere)? Are you a stay-at-home-mom, a retiree, a student or someone with a not so positive outlook at your present job who wants a change of career? Do you have something in your life that you love and are passionate about? Is this something you love to talk to others about? Does a significant part of your life deal with this passion? If you can talk about your passion, you can write about it as well. And if you can write about it, you can build a website, turn it into a business and earn money. You don't need to be an excellent writer. You just need to love what you write about. You need to sit down on the most comfortable sofa in your minds living room and talk to your friend. Tell others everything you know about this thing that you are passionate about. Of course you may not know everything about it, but you do have the greatest resource at your fingertips – the internet. You can use it to fill in the gaps along the way if there are any. Another special thing about SBI is the C2.0 part. Your visitors can help you build your website. Because if you talk to your visitors about your passion and they are passionate about the same thing, they will want to share this with you and ultimately other visitors. Well you get the picture. We, however, would have never been able to build such a quality site if we hadn't found out about Solo Build It!. We've had websites in the past. One cost us $1,000 and the other was a free blog. Neither of them produced the income we now have as a result of our SBI! website. Now we're not saying you can't make money with a $1,000 e-commerce website or even with a free blog. We're just saying we didn't. Whether it was from simply not knowing how or not doing enough. We just couldn't get it right. But now with SBI! we have and we wouldn't even consider trying to do it any other way. We loved our first website so much that we started another one. And we have plans for a few more. So you can see – something must be going right. "Is SBI right for me?" Take a look at the video below and see what you think. If you still have questions and would like to talk to someone first, click to ask. They will be happy to answer any concerns you may have about Solo Build It. Hey, we did and we were very happy with the response we received. And if you'd like to see other websites that are ranked in the top 0.5% sites online and/or learn more about Solo Build It!, click here. Go from About Solo Build It! to About Us.